Headlies: Fan Caught Making Up Names While Talking About Wrestle Kingdom - WrestleCrap - The Very Worst of Pro Wrestling! 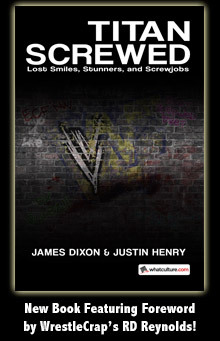 Shrewsbury, MA – During an extensive discussion of New Japan Pro Wrestling’s upcoming Wrestle Kingdom 12, it was revealed that longtime wrestling fan Jack Ames has been making up names and facts in order to sound like he knows what he’s talking about. 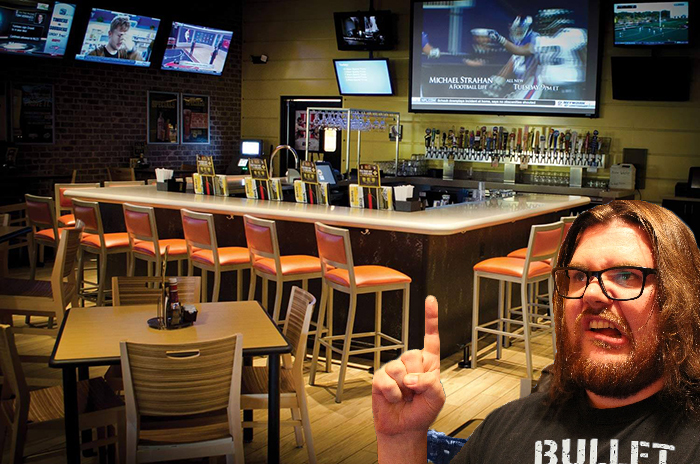 At the weekly meeting of the Super Wrestling Friends Club at the Shrewsbury Buffalo Wild Wings location, the group of wrestling fanatics excitedly discussed the upcoming Japanese supercard event. The group politely nodded along, despite not knowing who or what he was talking about. Realizing his ruse was in trouble, Ames quickly changed the subject to former WWE star Cody Rhodes, focusing heavily on his “Dashing” character from several years ago. The conversation eventually shifted to all-time great Japanese wrestling matches, further exposing Ames’s lack of knowledge. After mispronouncing current WWE star Shinsuke Nakamura’s name several times, Ames talked about a International Wrestling Enterprise match from the early 80’s featuring Fats Domino against Takeru Kobayashi. “We knew something was up when he said Chris Jericho would beat Pineapple Kojima,” said member Efrem Lewis. Ames’s plan finally fell apart when he referred to Bullet Club member Bad Luck Fale as “Mad Chuck Fail”. Ashamed but undettered, Ames vowed to make a comeback. 7 Responses to "Headlies: Fan Caught Making Up Names While Talking About Wrestle Kingdom"
That’s why I’m going to celebrate New Years Day by watching the famous All Japan classic 2-3 falls match between Goget Yasum and Showme Yurbeaver. It should be classified as a Hate Crime to like Mojo Rawley. Wasn’t Magno Habanero in a Real World Tag League with Pineapple Kojima in the early 2000’s? What’s the dif between shane o mac & hhh????? Now now, I’m pretty sure Fats Domino was the child of billiards legend Minnesota Fats. Poor Mr. Ames. He should’ve just rhapsodized about Obozoggo versus Napozango in the Korokeuen Hallway. Sega Nintendo’s match against Super Nintendo Chalmers at Thunderdome 1994 was a five-star classic. You mean Nakarounda Damatt vs. Kachingo Dacash wasn’t an actual match? I could’ve sworn Meltzer gave them a 4 5/16-star rating for their 30-minute Broadway last year. He would’ve given it 5 stars if not for overbooked run-ins by Kawasaki Hyundai and Asahi Sapporo (who later celebrated with a beer bash mid-ring). Classic Induction: WrestleMania Challenge – Hulkamania Battles Donkey Kong, Brother!